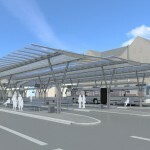 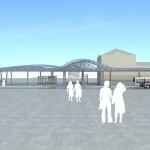 The city of Esslingen was interested in connecting all bus stops under a single roof in order to achieve a weather-protected interchange from bus to bus. 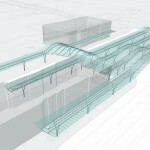 Schulitz Architects designed a linear roof system with minimal height respecting the historic railway station. 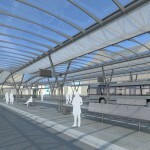 In spite of the dynamic form of the roof with variations in height, all glass panels are rectagular, thus minimizing the construction costs.